Yale University received a A+. Founded in 1701 by those who felt Harvard had lost its way, Yale took as its Latin motto Lux et Veritas, Light and Truth, to suggest that those in Cambridge could no longer see the Veritas. Thus was the Harvard-Yale rivalry born. The High School Musical-inspired admissions video Why I Chose Yale is a must (as is the Harvard Lampoon spoof, in which a Yalie singing next to a New Haven dumpster is mugged.) Four-year residential colleges subdivide Yale's undergraduate community into manageable units of familiar faces right from the start, and provide a lifelong association that graduates continue to treasure. Describe the type of student who should not attend Yale University and explain why. Describe the type of student who should attend Yale University. Why? If my behavior in school isn't that great, but my grades are strong is there a chance I can go to Yale? What is a typical Yale University student like? Describe the type of person that should attend Yale University. Everyone at Yale is awesome. People are super friendly, smart, and inspiring. People are very passionate and are willing to share their passions and talents with everyone. What are the top 3 reasons someone should attend Yale University? You should attend Yale because the people are amazing, the campus is beautiful, and the extracurriculars and educational opportunities are unmatchable. What was a typical Yale University student like in high school? Describe the type of person that should attend Yale University. One of the few Ivy league schools focused on undergraduates. One reason that many students feel overwhelmed is the 2,000 courses from which to choose. Getting in typically hinges on offering just what an admissions officer is looking to fill for a specific slot. Yale University boasts the outstanding academic programs [and a] dynamic student body. Welcome to Yale. We invite you to visit us at any time--in person or through this site--and explore the life of our campus. 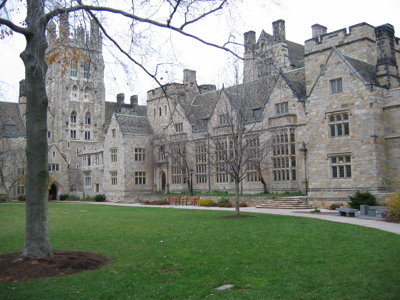 Yale is also a major research university. Led by a distinguished faculty, it carries on its education and research on the graduate level in our graduate and professional schools: the graduate school of arts and sciences, divinity, engineering & applied science, forestry & environmental studies, law, management, medicine, nursing, public health, and four schools of the arts: architecture, art, drama, and music. The University is home to one of the world's great libraries and three outstanding public museums and galleries--Peabody Museum of Natural History, the University Art Gallery, and the Center for British Art--that help to enrich the cultural climate of the university and city. Founded in 1701, Yale is a university with honored traditions. In the diversity of its students, its global outlook, and its outstanding research, it is also a university of compelling change. We welcome your interest in the University and in our community. Please browse Yale's Web pages for information on all aspects of the University and the activities of its students, faculty, and staff. If you are in the New Haven area, our Visitor Center offers daily tours of the campus and its architecture and facilities. What are the top 3 things that students do for fun at Yale University? Yale is super competitive to get into - but once you're accepted, are the students still really competitive? Or do things mellow out a bit? I hear that New Haven is dangerous and a bad place to live. Is that true? The average student pays $16,528 for tuition, fees, and other expenses, after grants and scholarships. Total stated tuition is $44,000, in-state and on-campus, before financial aid. Learn more about financial aid at http://www.yale.edu/aid/index.html. Estimate the net price for you at http://www.yale.edu/sfas/finaid/. The typical (median) early career salary of Yale University graduates is $50,000, according to Payscale. Yale University participates in the NCAA Division I-AA for college athletics. Want more info about Yale University? Get free advice from education experts and Noodle community members. If you were student body president of Yale, what would you change? argumentative essay topics for middle school students include every element of modern life, you if you need to find a suitable topic to write about, be sure you will succeed. What do you like about Yale's campus and culture? What are 5 adjectives that describe a typical student at Yale? What are the most popular extracurricular activities at Yale? Does Yale have a premedicine Program? Do you feel that Yale prepared you well for the work force, or is there more the school could have done to make you a competitive job applicant? Can you have a real work/life balance at Yale? Or are you stuck in the library the whole time? Is Yale somewhat diverse (ie: does it feel like there's a social circle for all different types of students?) Or is it super preppy? What was your experience like at Yale?